My adoration for statement necklaces knows no bounds. I've always been an accessories kind of girl. Simple outfits always get jazzed up. Bold looks always get a little bolder. While I have also made exceptions to my loading of accessories, this particular outfit was all about my necklace. I recently received this piece from Daisy Gem and I adore the art deco style and the emerald green color. The best part about this piece is that Daisy Gem is donating a portion of their proceeds to a non-profit of my choice. I instantly chose the Make-A-Wish Foundation. I've always admired the foundation but after I wrote about SF BatKid, I have been more than eager to support the organization. Daisy Gem pieces are so reasonably priced already but by using the code ADO15 you will receive 15% off your purchase AND Daisy Gem will donate to Make-A-Wish. The best kind of purchase don't you think? I've been REALLY into statement necklaces--especially in pregnancy where they are the only thing that still always fits. LOL I really love this outfit on you! The skirt is one of my faves of yours. Gorgeous necklace - I love how it pops against the brown and orange color palette! That bag Nancy!! I love it, and it love it with this outfit. Also, I agree...statement necklaces are where it's at. They are a great way to jazz up any look. ....Loving the booties with the midi skirt. I love love love that skirt, its beyond adorable. I also love how you styled this look. You look great. i loveeeee that skirt. the color, the length, the shape, adorable. also that necklace, that green is so perfect! i love it. you need to teach me how to wear statement necklaces sometime! The colors in this outfit are so pretty and I love the print on the skirt. 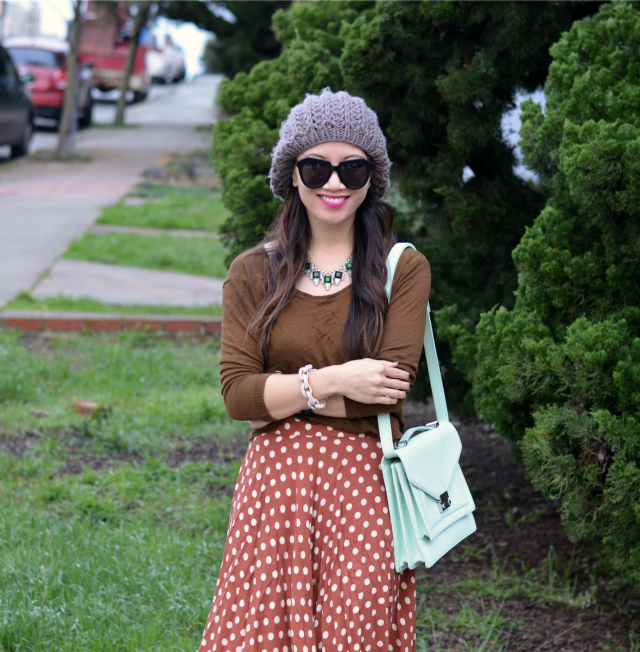 The mint skirt pops so perfectly! This is gorgeous.....love that skirt!! I know statement necklaces are so fun and a trend that is sure to be around for a long time.Love how you styled this one. That is one gorgeous statement necklace and what makes it even better is that it gives back. Love that skirt and that necklace is stunning! GREAT boots and that skirt is gorgeous. I'm really jealous that you thrifted that. I'm supposed to be the thrifting queen! LOVE the necklace! I have an emerald skirt that it would look perfect with! But it's out of stock right now...I'll have to nab it when it comes back in! Loving this look Nancy...that skirt is the cutest! the necklace is beautiful! and your skirt as well! love the skirt!!!! happy vday gorg! xO! This is a lovely and unique look. I love the necklace with your knit hat. Happy Valentine's Day. Daisy Gem is pretty awesome. I love their stuff and this fantastic cause! I get a lot of my statement jewelry (including Daisy Gem) from ShopLately. Is that where you get your stuff from? They have a ton of great statement pieces. a pretty necklace and a good cause? i'm in! What a great skirt and necklace! Have a great weekend! This is such a cute outfit! I adore that skirt. It looks amazing with your outfit Nancy and what a great cause doll. I love the charity you picked. Love the touch of mint in your bag and that flirty skirt! yay totally agree with the statement necklace! brings out ur outfit! 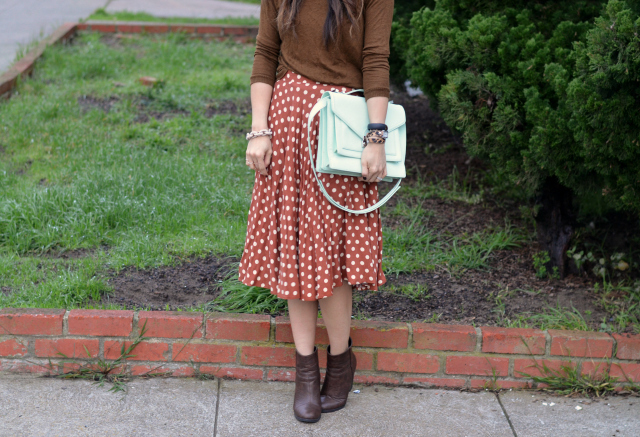 Soooo in love with this skirt, and I love how you styled it! What a cool company to do that. 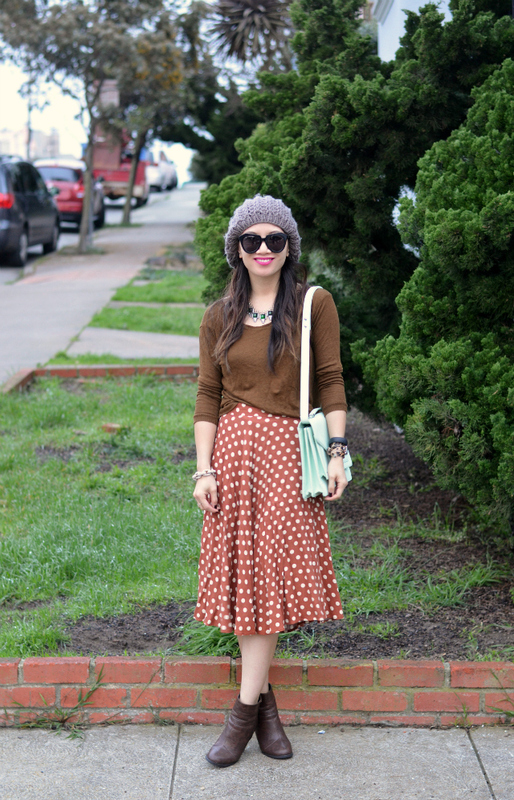 I love this entire outfit but my favorite part is definitely that skirt!